Well, Mardi Gras was last Tuesday, and I’m sure everyone in the drink blogosphere has been getting an ample dosage of information on the Sazerac, the official cocktail of New Orleans, but nothing doing on this blog…we’ll save it for Cocktail Night VII, during which we’ll mix up three different versions of the famous drink. In between now and the next cocktail night, however, we’ll take a look at some other drinks that were created in or made popular by the Crescent City (a surprisingly large number, when all is said and done). There’s the quintessential Sazerac, sure, but there’s also the Milk Punch and the Hurricane, plus the more obscure (but equally delicious) Vieux Carré, Louisiane, and Ramos Gin Fizz. Of course, you also have your oddball imports, which include absinthe and absinthe-based cocktails (understandable given the city’s French background) and the very British Pimm’s Cup (How’d it get there? No idea, but I’ll try and find out). We’ll mix up all of the aforementioned drinks and hopefully I’ll cover a few interesting finds from Stanley Clisby Arthur’s Famous New Orleans Drinks and How to Mix ‘Em (1937) — once I receive my copy, that is. C’mon, Amazon, go faster! So, first up will be a drink I’m very fond of: the Vieux Carré, sort of a Louisiana-fied cousin of the Saratoga and the Manhattan and a distant relative of the Sazerac and the Old-Fashioned. Stir with ice and strain into a rocks glass over a large chunk of ice. Alternatively, build everything over ice in a double rocks glass. Many like to garnish with a lemon twist. Adapted from The Essential Bartender’s Guide by Robert Hess, among other recipes. Translated, “Vieux Carré” means the “Old Square,” or what’s called the French Quarter by us silly English-types (it also happens to be a play by Tennessee Wiliams). The drink itself was first mixed in 1938 by one Walter Bergeron, head bartender at the Hotel Monteleone. The Monteleone’s lasting claim to fame is its Carousel Piano Bar & Lounge: installed in 1949, the bar resembles a carousel (though the top was added in the 1990s) and the entire assembly — bar and bar stools — rotates once every 15 minutes. I can imagine how personal navigation might suffer after a few too many Sazeracs and Vieux Carrés on the carousel. For decades, though, according to Ted Haigh, the once-signature drink was not offered at the Carousel Bar (that and the waitresses didn’t seem to know about it) but thanks to recent cocktail revival and to Tales of the Cocktail, you can now enjoy a properly-made Vieux Carré on your revolving bar stool. The result of all this revolutionary mixing is an emblematic blend of French and American flavors — rye having come down the Mississippi, cognac and Bénédictine from France, Angostura bitters from the islands, and Peychaud’s bitters from just down the street. Oh, right, and the Italian vermouth…not sure how that works. Anyway, it’s a great alternative to a Sazerac, but who’d ever get tired of those? As with all cocktails, the choice of spirit makes quite a difference, but it’s especially important here since you have a blend of base liquors. With the Vieux Carré, you’ll probably want a heavy-hitting cognac and rye to match the strength of the vermouth and Bénédictine, but be careful. I went with Rittenhouse to balance out the Carpano Antica and its extra-strong flavor. A High West rye would probably offer a little too much oomph here, as would Wild Turkey 101. To match the Rittenhouse and Carpano, I chose Camus, which has a kind of brash, fruity character that holds up well — Chalfonte and Pierre Ferrand Ambre are a little too docile. If I were using Martini or Cinzano vermouth, I’d like go with softer spirits like Sazerac rye and Chalfonte cognac. The sugary, herbal Bénédictine (try out different amounts of it, again depending on your base spirits) helps round out the flavors of the liquors while the bitters add depth and a fruity spiciness while cutting the sweetness down a bit. And I do prefer mine with a lemon twist. If you need a little visual instruction on the making of a Vieux Carré, you can’t go wrong with Robert Hess. In addition to the aforementioned book by Arthur, another intriguing tome is Phillip Collier’s Mixing New Orleans, currently out-of-print but to which I’m sure I’ve seen a few references…perhaps it’ll find its way into my cocktail library, as well. UPDATE, MARCH 3, 2012: I missed his post the first time around, but Doug Ford over at Cold Glass has a version of the Vieux Carré that is served “up” in a cocktail glass alongside some beautiful photos and a mention of its similarity to the Saratoga; he chose Rémy Martin VSOP, another fine option for cognac in this cocktail. 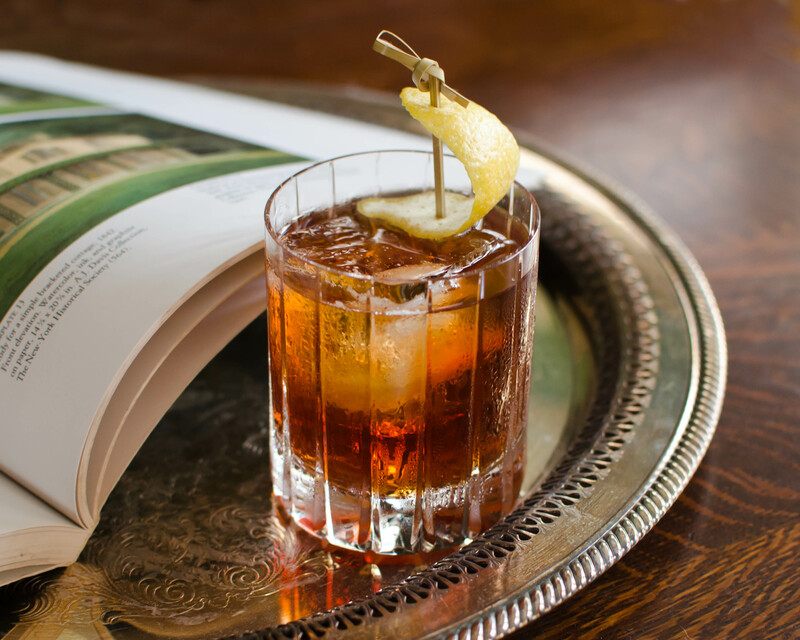 UPDATE, MARCH 4, 2012: The latest Imbibe offers up a riff on the Vieux Carré called the Jersey Quarter, which comes from Mayur Subbarao of Post Office in Brooklyn. Want to make one? Just switch out the cognac for apple brandy and toss both orange and lemon twists into the drink. Delicious! This entry was posted on March 1, 2012 by IJ Lauer in Angostura, Benedictine, brandy, cognac, Drink Recipe, Peychaud's Bitters, Rye, Sweet Vermouth and tagged angostura bitters, benedictine, cocktail, cognac, new orleans, peychaud's bitters, recipe, rye, sweet vermouth, vieux carre.